This week we're celebrating the release of Erica's book, Candid Classroom: What Parents Want to Know and Teachers Want to Tell Them (! ), while enjoying a grapefruit beer mimosa. The mocktail version is made with non-alcoholic beer! Into each glass filled with ice, pour 1/2 a bottle of wheat beer (Erica had Blue Moon, Kelsey had a nondescript non-alcoholic beer), 2 ounces of fresh grapefruit juice and 1/2 ounce of simple syrup. Stir and garnish with a wedge of grapefruit. Cheers! 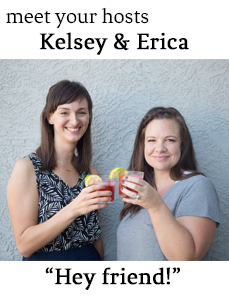 Erica gives us some behind-the-scenes details about finishing up Candid Classroom and we talk about what readers can expect from the book (spoiler alert: a funny, personable read with real-life tips for parents on navigating school and establishing great parent-teacher relationships). We're also talking about taking on big dreams and what's next on the horizon for both of us. Around the neighborhood, Saw Guy has made some major landscaping changes, mostly for the better; political signs are going up everywhere but not always having the desired effect; the u-turns are getting a little out of hand; and we daydream about the ideal new businesses for the shopping center near our neighborhood.